He also seems to have had an interest in "orthoepeia"—the correct use of words—although this topic is more strongly associated with his fellow sophist Prodicus. In his eponymous Platonic dialogue, Protagoras interprets a poem by Simonides, focusing on the use of words, their literal meaning, and the author's original intent. This type of education would have been useful for the interpretation of laws and other written documents in the Athenian courts. Diogenes Laërtius reports that Protagoras devised a taxonomy of speech acts such as assertion, question, answer, command, etc. Aristotle also says that Protagoras worked on the classification and proper use of grammatical gender. The titles of his books such as, Technique of Eristics (Technē Eristikōn, literally "Practice of Wranglings", with wrestling used as a metaphor for intellectual debate) prove that Protagoras also was a teacher of rhetoric and argumentation. Diogenes Laërtius states that he was one of the first to take part in rhetorical contests in the Olympic games. 1 2 Guthrie, p. 262–263. ↑ Aulus Gellius, Noctes Atticae 5.3. ↑ Filonik, Jakub (2013). "Athenian impiety trials: a reappraisal". Dike (16): 36–39. doi:10.13130/1128-8221/4290. 1 2 3 Poster, Carol (2005) . "Protagoras". Internet Encyclopedia of Philosophy. Retrieved 22 October 2013. 1 2 3 4 "The Sophists (Stanford Encyclopedia of Philosophy)". Stanford Encyclopedia of Philosophy. Retrieved 2012-05-01. ↑ Mattey, G.J. "Protagoras on Truth". Retrieved 22 October 2013. ↑ Bostock, D (1988). Plato's Theaetetus. Oxford. ↑ This quotation is restated in Plato's Theaetetus at 152a. Sextus Empiricus gives a direct quotation in Adv. math. 7.60: πάντων χρημάτων μέτρον ἐστὶν ἄνθρωπος, τῶν μὲν ὄντων ὡς ἔστιν, τῶν δὲ οὐκ ὄντων ὡς οὐκ ἔστιν. The translation, "Man is the measure ..." has been familiar in English since before the rise of gender-neutral language. In traditional English usage, man referred to hominids. Similarly, in Ancient Greek, Protagoras used the Greek word anthrōpos (human being, person), making a general statement about human beings. ↑ Lee, Mi-Kyoung (2005). Epistemology after Protagoras: Responses to relativism in Plato, Aristotle. Oxford: Oxford University Press. ISBN 0-19-926222-5. ↑ Poster, Carol. "Protagoras". Internet Encyclopedia of Philosophy. Retrieved 28 February 2014. ↑ The Internet Encyclopedia of Philosophy - Protagoras (c. 490 - c. 420 BCE), Accessed: October 6, 2008. 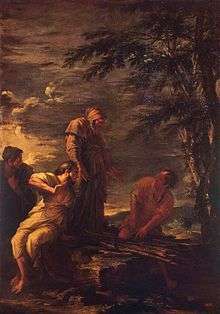 "While the pious might wish to look to the gods to provide absolute moral guidance in the relativistic universe of the Sophistic Enlightenment, that certainty also was cast into doubt by philosophic and sophistic thinkers, who pointed out the absurdity and immorality of the conventional epic accounts of the gods. Protagoras' prose treatise about the gods began "Concerning the gods, I have no means of knowing whether they exist or not or of what sort they may be. Many things prevent knowledge including the obscurity of the subject and the brevity of human life". Laërtius, Diogenes (1925). "Others: Protagoras". Lives of the Eminent Philosophers. 2:9. Translated by Hicks, Robert Drew (Two volume ed.). Loeb Classical Library. "Protagoras". Encyclopædia Britannica (11th ed.). 1911.